Mentioned is the way you can write free blank CV template to fill in . 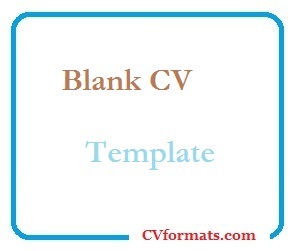 You can also download blank CV template or format in word or pdf format or just view it online to copy and paste. Cover letter of blank CV form is also available. Just change the name , address , qualification and experience and your free blank curriculum vitae Template / sample is ready. This section contains a summary of your experience, skills and abilities. You should specify the exact abilities you have which will be relevant to the prospective employer thus increasing your chances of being invited for that interview. Many people do not include this part but it is very important. Here you should write your professional and personal strong points. This includes the duties that you are most competent in. Start Date – to current date: Job Title, Name of your current employer or your last employer if you are not currently employed. State all relevant previous employment positions you held in the past in the same way. List the activities that you enjoy engaging in. Use this part to show yourself in good light so don’t write things that will make the employer not want to hire you. Write the professional seminars that you have attended that are related to the job you are applying for. Thenks for good site. reple reply to cv found in website of earlier work. in msn, hotmail.presently in either work places prefer keerta. in next teerta earlier work presumed here. already cv up online. I am a graduate of Business Administration , an hons degree holder with major finance. i am seeking a job in bank and i have done 6 months internship in HBL as well. please give me some beneficial tips for my resume.